smudge and is not heavy on the skin. Strobing – amaze everyone with the trendiest makeup look. Strobing is a term coming from the world of photography, where it denotes a method of taking pictures with the use of strong light or a flash. When used in reference to the art of makeup, it means modelling your face with the use of a highlighter. This type of makeup is also referred to as glow, which is one of the key trends of 2019. Method 1. Under your foundation (after having applied your day cream and makeup base). Method 2. 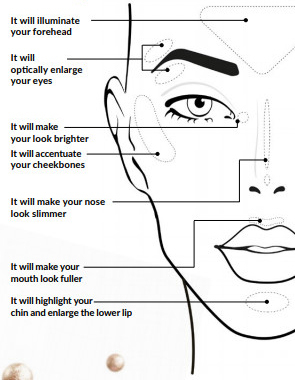 In spots on your foundation (according to the diagram) to achieve the strobing effect. Method 3. 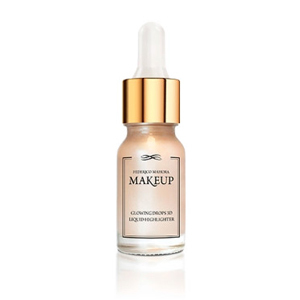 Add a drop of your favourite foundation and blend on your hand directly before application. How to apply makeup using the strobing technique?